Growing up, I was a big dreamer: college, marriage, family, career. I was enthusiastic, active, and driven. I didn’t let the anxiety I began experiencing when I was roughly nine, the depression I began experiencing when I was 14, or the hypomania which started at age 18 deter me from achieving goals. Truth is, although I was symptomatic, it was not to a level which interfered tremendously with daily life. Things didn’t really get side-tracked until my first psychotic break at age 23. At that point that my life turned completely upside down. Initially doctors thought I lived with symptoms of bipolar disorder, but they finally decided I lived with symptoms of treatment-refractory schizoaffective disorder bipolar type with catatonia. In other words, it really didn’t matter how compliant I was with the medication, we just couldn’t find something that worked. After 12 years and 37 different combinations of five classes of medications, more than 100 electroconvulsive therapy (ECT) treatments, countless hospitalizations and several long-term institutionalizations, I was sick of being sick. Since nothing was working, I knew I needed to try something I’d never tried before to somehow salvage what had become of my devastated and hopeless existence. For me, the hardest thing seemed to be that these mood fluctuations, the volume of arguing running critique by disgruntled three or four voices and the severity of mixed mania just seemed to blindside me from nowhere. One hour I would feel happy about life and the next I would be a raging, agitated, inconsolable, psychotic mess. When I first learned about WRAP, the concept seemed simplistic. I was tired of things people without mental illnesses had contrived to “support” those of us with symptoms. In discovering that Mary Ellen Copeland is a peer with a graduate degree, I signed up immediately wanting to learn her tricks of the trade. Imagine my surprise and joy when I learned that it wasn’t a standardized protocol, but rather one individualized to meet each person’s needs. Having the class facilitated by a peer who happened to live with my diagnosis was eye-opening. Until that point in my journey, the only people I had ever met with my diagnosis were in restraints in the ICU, locked away in the institution, homeless or living in group homes staring blank-faced and over-medicated at life happening around them—much like me. Yet there in front of me was a peer support specialist employed, living independently and in my eyes doing so successfully. She even had a significant other. But how, after a 12-year detour, could I get from where I was to where she was? The answer unfolded through the course of the class—make and keep a WRAP. For me, the most valuable part of beginning my journey with a WRAP was learning to identify what I was like when I was well. It had been so long since I felt well, that this was actually a very difficult, but enlightening process of discovery. Coupling that with recognizing and planning for circumventing the severity of triggers, enabled me to begin fine tuning the learning process of maintaining wellness. Over a course of several months, I began to become more adept at recognizing when I very first felt a little off and then work to get myself back on track. Much like the switch of a train track, the faster I became at recognizing when things were off, and understanding how they came undone, the easier it became to put myself back on course. I realized that previously, I had lived as that thoughtless “switchman,” bumbling through life without recognizing my triggers until my proverbial life’s train ended up in Jersey while I sat teary-eyed and lost in the equivalent of a destination at which I’d never intended to arrive. Within several months of meeting my first peer support specialist, I had acquired enough proficiency in using my wellness tools and self-assessing how to improve my wellness, that I moved out of the abusive group home I’d been stuck in, found a room to rent, and began working a part-time job. From there, the more I fine-tuned my WRAP, the closer I became to achieving my goals. One by one, over the next several years, I began achieving things I’d dreamed about while locked away—things professionals called “grandiose.” But just because they couldn’t envision how my life would unfold didn’t mean my dreams were unattainable. My success springs from an ever-increasing ability to self-assess, recognize what I’m like when I am well and a dig into my highly refined wellness toolbox at the first recognition that I might be off course. This refining process allowed me to begin recognizing foods and other causes of inflammation, ultimately leading me to a doctor who recognized my refractory psychiatric symptoms were caused by toxic encephalopathy. The beauty of WRAP is that as we work together to brainstorm wellness tools, we build upon a valuable resource of cumulative knowledge, allowing us to finally stop getting blindsided by symptoms—allowing each of us to get back on track and arrive at our preferred, unique destinations. It’s never too late to get back on track. Potential has no expiration date. Hear more about my journey and wellness tools here. 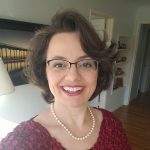 Sarah Price Hancock is an independent researcher trained as a Certified Rehabilitation Counselor with a specialization in psychiatric rehabilitation. She regularly teaches guest lectures on psychiatric recovery and rehabilitation for psychiatrists, psychologists, marriage and family therapists, social workers, nurse practitioners, peers, and family members living with a loved one diagnosed with mental illness. She worked 4 years as an adjunct professor for San Diego State’s Rehabilitation Counseling clinical tract. She loves learning about the gut-brain connection, discovering a passion for healthy cooking in the process. She and her husband live in San Diego, CA. Find Sarah online at https://www.humanbiomerehab.com/.